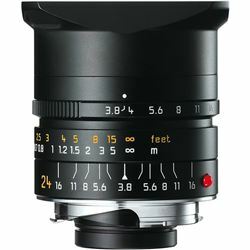 Used on the digital LEICA M8 models, an equivalent focal length of 32 mm is obtained due to the slightly smaller image sensor. This extremely practical focal length enables a wide spectrum of applications extending from true-to-life portraits to landscape and architecture photography. 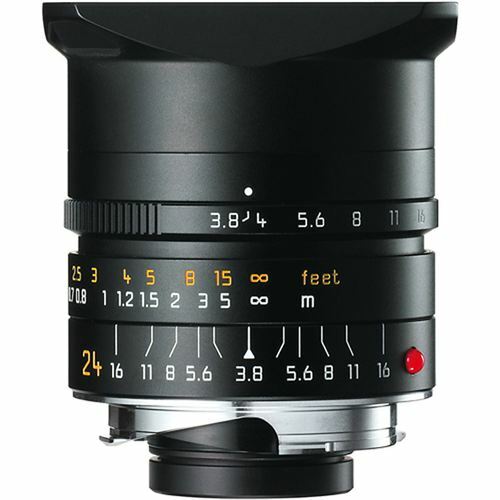 The LEICA ELMAR-M 24 mm f/3.8 ASPH is the ideal combination with the snap-shot mode of the new LEICA M8.2. The initial aperture of 3.8 can be used unrestrictedly as contrast and detail rendering are already excellent at this setting. Stopping down is practically only necessary for increasing the field depth. Stopped down to medium values, the field depth range is so great that entire landscapes will be depicted in sharp focus. Particularly suitable for photojournalistic reportage and architecture photography when utilizing the full 24x36 mm picture format.